The joint surface of all bones of the ankle and foot are lined by a thin, tough, flexible, and slippery surface called articular cartilage, which acts as a cushion to reduce friction between the bones. The cartilage is lubricated by synovial fluid that further enables smooth movement of the bones. The foot and ankle bones are held in place and supported by ligaments, muscles, and tendons. Due to poor blood supply, injuries to connective tissue of the ankle or joints in the foot often do not heal quickly or effectively. Cellular Regenerative Procedures, such as PRP and Prolotherapy using adult stem cells, accelerate and enhance the natural healing process, supplying healing cells when the body becomes in short supply due to chronic injury or even plain aging. Blood flow to the affected area is increased, removing damaged tissue and supplying nourishment necessary to the healing process. Ankle sprain/strain. Ligaments are tough rope-like tissues that connect bones to other bones, holding them in place to provide stability to the joints. When stretched too far, ligaments become damaged and swelling, pain, and bruising will develop. 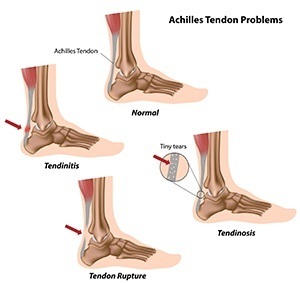 Achilles tendonitis/-osis. The Achilles tendon is a band of tissue that connects the major muscles of the calf to the heel. The exertion of force or repeated stress on the tendon can cause it can to become overworked and inflamed. The ankle becomes less flexible and pain is felt along the back of the ankle or lower leg, usually close to the heel. Achilles tendon rupture. This strong fibrous cord behind the ankle ruptures most often in athletes participating in sports that involve running, pivoting, and jumping. Pain may be severe. Swelling and stiffness are common. If the rupture of the tendon is not complete, cellular regenerative procedures can be an effective treatment. Osteoarthritis. Arthritis is inflammation resulting from the degeneration of cartilage in the joint that causes pain, swelling, and stiffness in the joints. Movement becomes restricted. Arthritis of the foot and ankle joint can occur due to fracture, dislocation, inflammatory disease, or congenital deformity. When left untreated, shifting of the bones may occur. Plantar fasciitis/ Heel spurs. Plantar fasciitis refers to inflammation of the plantar fascia, a thick band of tissue that lies at the bottom of the foot. It runs from the heel bone to the toe and forms the arch of your foot. The plantar fascia functions as a shock absorber and supports the arch of your foot. Excessive pressure over the fascia may strain and tear the tissue causing heel pain. Repeated overstretching or overuse causes irritation or inflammation of the fascia. Regenerative cellular procedures help to heal this condition more quickly and effectively without the necessity of extended rest. Plantar fasciitis is one of the most common causes of heel pain. It is most often seen in middle-aged men and women, but may also occur in those who are constantly on their feet. Impact from running or other sports, along with tight calf muscles and excess weight can contribute to this condition. Morton’s neuroma. Morton’s neuroma refers to a nerve injury between the toes, usually the third and fourth toes, which causes burning pain in the ball of the foot. Thickening of the nerve tissue generally occurs due to scar tissue. Compression or chronic irritation of this interdigital nerve is the main cause of Morton’s neuroma. For more information on treatments for foot and ankle conditions please visit Our Services page.